When creating a compact action request, users will now be required to select a CAR specialization or link it to a specific compact activity. If the user selects "Link to Compact Activity", another drop down appears listing the available items to which the CAR can be linked. The linked activities will be shown in a tree structure on the offender profile after a future enhancement release. 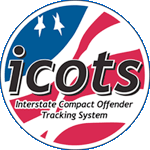 ICOTS users with the compact office role can now create and submit compact action requests on a compact case without reassigning the case to themselves first. The compact action request will be available on the activity drop down of the compact case view on the offender profile. Users can now reassign individual compact cases for a single offender regardless of whether both cases are assigned to the same user. Previously, once two compact cases were assigned to the same user (in either the sending or receiving state), those cases could no longer be assigned to separate users again. This enhancement mostly affects bifurcated states where dual supervision cases are assigned to different receiving state users. Previously, only the supervising user for an offender could create a progress report. This led to issues where the other assigned user in the receiving state could not create and submit the activity. Now the only requirement for a user to create and submit a progress report is that they be assigned to a compact case as the receiving state.